What are the existing skill sets of the Syrian refugees in these countries? Are Syrian refugees working in these countries, and if so, what type of work are they currently doing? What are barriers to Syrians working and their perceptions of the workplace? What are the Turkish, Jordanian, and Lebanese citizens' attitudes toward these migrant workers? Are there opportunities in the labor market that are both beneficial to Syrians and would also add economic value to the host countries? What policy and program improvements could be recommended to realize the gains from such opportunities? The Syrian Civil War has displaced 60 percent of the country's population. Six million refugees live in neighboring countries in the Middle East. Such a large refugee influx has been a severe strain to these countries' labor markets, public services, and social cohesion. This RAND report examines the problems of and opportunities for the labor market for displaced Syrians in Turkey, Jordan, and Lebanon. The authors used multiple methods: interviews with stakeholders, focus groups with Syrian and host country workers, in-depth interviews with firms, and surveys of firms and Syrian households. The existing skill sets of the Syrians are compared to the needs of each country's labor market; and the steps needed to improve the overall economic climate and strategies for preserving and improving social cohesion of refugees and host communities are examined. Each country has its specific challenges. For example, in Turkey a key barrier for the refugees was the ability to speak the language. In Jordan and Lebanon, the existing economic slowdowns and lack of jobs were exacerbated by the arrival of the refugees. Working legally was a challenge in all countries. The authors conclude with recommendations tailored to each country. Some of these include offering language classes (in the case of Turkey); assessing geographic areas where jobs are needed and enabling migrants to move to these regions; improving each country's worker certification process so that qualified migrants can get jobs within their area of expertise; investing in infrastructure projects and better training courses; and improving the business environment for all. Many Syrians are working or are willing to work, but many cannot find work. There are geographical mismatches between where Syrians are concentrated and where job growth is. Few Syrians have work permits, and pathways to formal employment are limited. Vocational training programs have not been well coordinated with job placement, market needs, or Syrians' skills. Informal employment is being permitted by governments by not enforcing work requirements strictly. Many host country workers resent Syrian migrants being in the labor force but also express compassion for their circumstances. 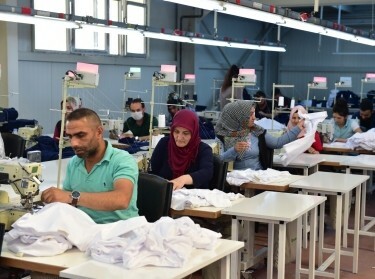 Firms noted opportunities for Syrians particularly in middle-skill jobs in manufacturing. The lack of Turkish language skills is a prominent barrier to refugee employment. Syrians are active entrepreneurs and have been finding ways to get by. Syrians face difficulty having their education and professional certifications recognized. Structural economic problems and the ensuing economic slowdown were exacerbated by the arrival of refugees. Syrian refugees can work in limited sectors and occupations and are shut out from setting up businesses where they would have an advantage. Syrians are seen as hardworking. As with Jordan, structural economic problems and the ensuing economic slowdown were exacerbated by the arrival of refugees. Public works and infrastructure projects are seen as way to create jobs for both Lebanese and Syrians. There are deep suspicions about Syrian workers, and a large discrepancy exists between perceptions and realities of the refugee situation. Expand Turkish language training and capacity. Expedite recognition of Syrian credentials and educational degrees. Assess where industries have trouble filling jobs geographically and then enable Syrians and Turkish workers to move to these regions. Conduct demand-driven, on-the-job training linked with employment opportunities. Provide safe transportation for women to places of employment. Build on existing programs in job matching and expand these in regions with the most Syrians. Facilitate work permits for Syrians under Temporary Protection Status. Offer short vocational training courses on needed skills and identify promising training initiatives. Improve skills assessment and certification of worker skills. Address employee turnover in firms by including mechanisms such as two-sided notice. Simplify and streamline the procedure of issuing work permits. Reassess the assistance provided by multilateral agencies to Syrian refugees. Improve environment for doing business for all. Increase capacity of government agencies. Invest in large-scale infrastructure projects. Improve transportation infrastructure and services to factories in the industrial zones, particularly for Jordanian and Syrian women. Offer short vocational training courses on needed skills. Address the gap between reality and perceptions regarding Syrian refugees. Krishna B. Kumar @kbkumar_, Shelly Culbertson @SC_Culbertson, et al. The research described in this report was funded by the Qatar Fund for Development (QFFD) and conducted by RAND Education and Labor. Kumar, Krishna B., Shelly Culbertson, Louay Constant, Shanthi Nataraj, Fatih Unlu, Kathryn E. Bouskill, Joy S. Moini, Katherine Costello, Gursel Rafig oglu Aliyev, and Fadia Afashe, Opportunities for All: Mutually Beneficial Opportunities for Syrians and Host Countries in Middle Eastern Labor Markets. Santa Monica, CA: RAND Corporation, 2018. https://www.rand.org/pubs/research_reports/RR2653.html. Also available in print form.